The task was to create a five-story building to house the entry lobby and two duplexes. The two firms worked as a team: BKSK was brought in by Related, who purchased the building after it was fully complete, with CetraRuddy acting as the architect of record and production architect for the residence. 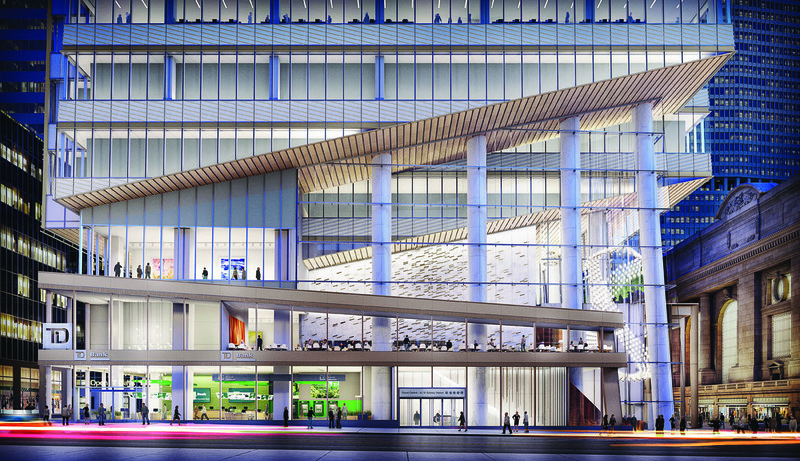 Kendall and Krevlin ultimately imagined the entry structure as a giant front door. 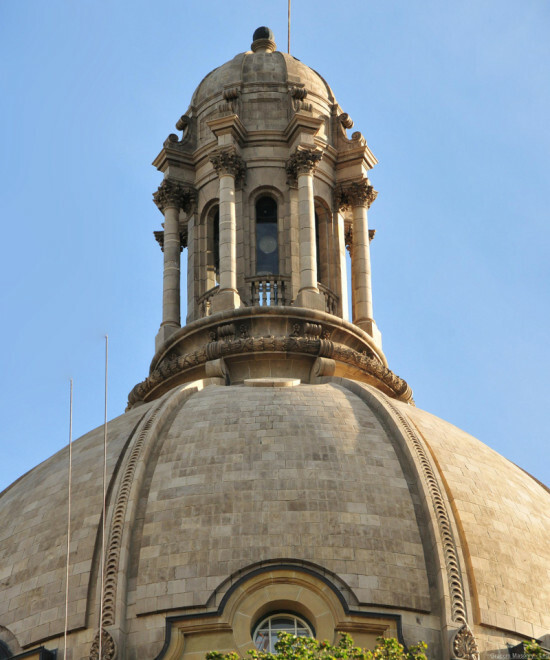 “22nd Street is a beautifully scaled block that has lovely stone and terra-cotta buildings. We wanted to do two things—design a building that actually felt as much like a gateway as a building, and we wanted to do something that was respectful of the nicely textured and well-scaled block.” The team began to consider a contemporary material that would allow for such a combination and considered it a good opportunity to use terra-cotta because of its malleability. “We looked at the block and the body material of most of its buildings,” said Krevlin, the partner-in-charge on the project. 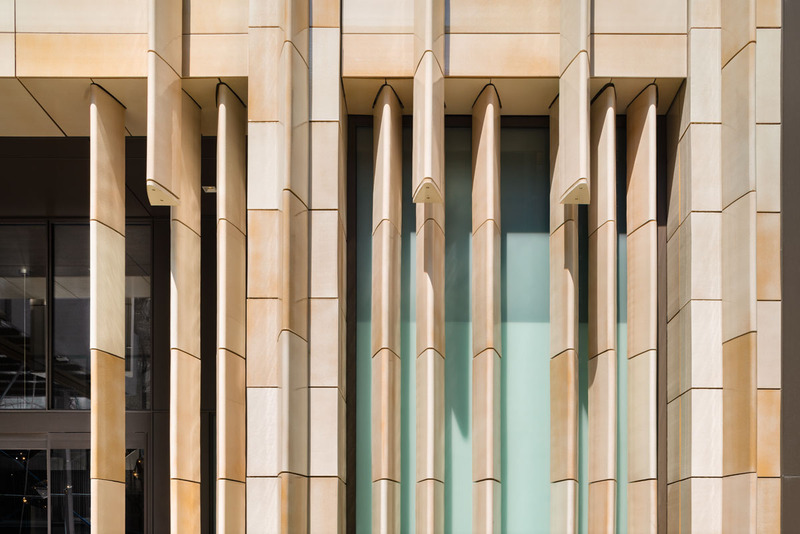 “We were pulling out the more decorative elements and having that act as the whole facade.” Krevlin and Kendall wanted some shimmer and reflectivity to the material to catch the morning and Western light and knew that terra-cotta could be glazed to their specifications. 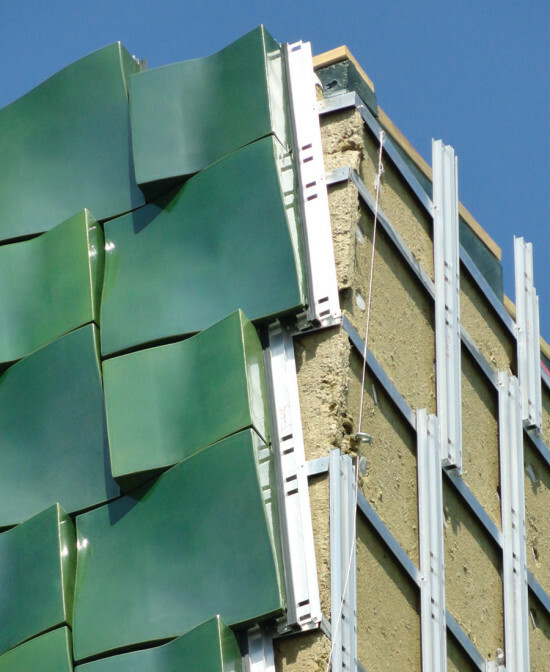 The custom fins, manufactured by Boston Valley Terra Cotta, are comprised of three pieces: The pointed piece is extruded and has a joint with two other flat elements. The fins are then hung on an aluminum substrate that cantilevers off the building and attaches to the slabs so that they float in front of the glass. The fins were intentionally staggered to give the building rhythm, and a custom bronze and glass storefront with sliding glass doors sits behind them. The John and Mable Ringling Museum of Art, part of a historic 66-acre estate in Sarasota, Florida has received a striking new pavilion designed by Machado Silvetti to house new gallery and multi-purpose lecture space. Officially called the Center for Asian Art in the Dr. Helga Wall-Apelt Gallery of Asian Art, the project features a custom glazed sculptural terra cotta clad volume elevated off the ground, and attached to the museum’s West Wing galleries via glass bridge. The new 7500 sq. ft. pavilion establishes a new monumental entrance to the museum, and assists in the reorganization of site circulation and infrastructure systems. Teaming with Boston Valley Terra Cotta, the architects developed a cladding strategy to respond to specific environmental, programmatic, and budgetary criteria. The project is inspired by lush foliage and historic architectural ornamentation found within the Ringling estate. Craig Mutter, Principal at Machado Silvetti, says the gallery-based program of the new addition led the project team to considering a conventionally constructed box with very few windows, to reduce glare: “We put our design energies into creating a high performance building envelope.” Machado Silvetti teamed with Boston Valley Terra Cotta, an upstate New York-based architectural terra cotta manufacturer. “We were involved very early in the process," says Bill Pottle, Boston Valley International Sales Manager. "We went from hand sketches to a 3D digital format where we were able to go back and forth with the architect and talk about different sizes. This helped us rationalize and execute the project to fit into both manufacturing and budget parameters." The tiling of the facade was achieved with three primary shapes optimized to the rack size of the kilns utilized in the production of the modules – a 24” square, a 24” portal framing a window opening, and an 18” square. All together, with custom pieces at corners and end conditions, no more than 10 unique shapes were required. The repetitions allowed for efficiencies in the production process, which paired digital modeling and fabrication with hand craft. The modules were made one at a time, weighing between 60-70 pounds apiece. 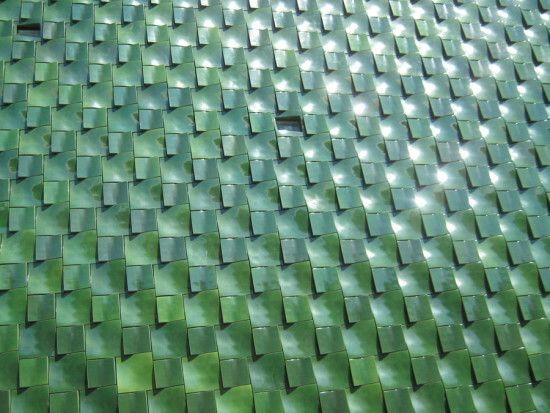 In total, 2750 three-dimensionally shaped ceramic modules were installed on the building. This manufacturing method became a significant constraint on the architectural design, said James Smokowski, Project Manager at Boston Valley. "The size limitation of the RAM drove a number of design changes from the architect.” Initially calling for a 60" x 60" tiled piece, the architects revamped their design to fit within the dimensional constraint of the kiln equipment. Rhino3D models were prototyped into shells using a 5-axis mill, which became the formwork for a hydraulically operated RAM press. 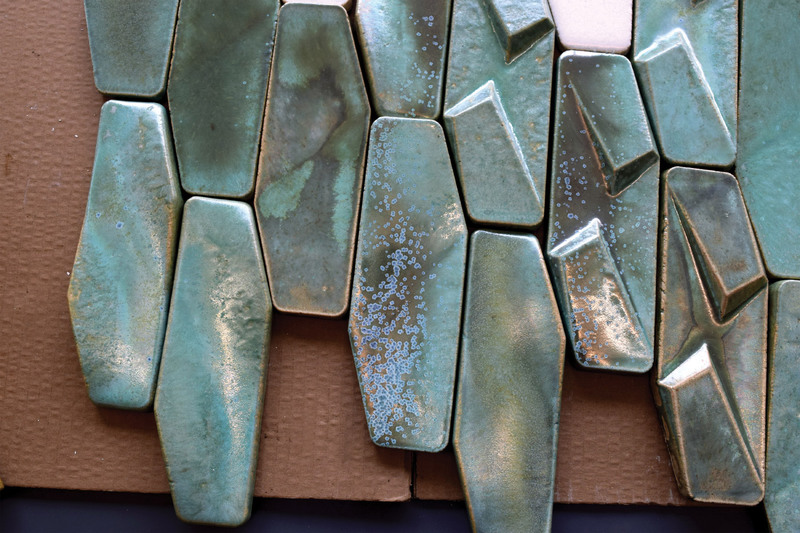 A sense of depth was established both by the chiseled three-dimensional form of the ceramic modules and a custom green glaze developed by Boston Valley. Due to the geometry of the modules, the glaze pools in the concavities creating a coating with variable depth. The terra cotta modules were installed on a modified version of Boston Valley’s standard Terraclad stainless steel track and clip system over a standard wall construction of concrete framework infilled with concrete block units. This detailing allowed for cost savings and assisted in the pre-qualification of terra cotta installers. Adjustments to the stock rainscreen system were made to create a consistent 3/8” gap around the full perimeter of each modules, ensuring individual pieces are able to be removed and replaced in the event of any damage. Windows were used sparingly on the facade, composed into clusters where interior program can accommodate some glare. These “clouds” of windows occur in the third floor meeting room along the north facade, and are distributed throughout the facade with careful attention to reducing glare within the gallery space. Despite having significant views to the picturesque Sarasota Bay, windows are used sparingly as accents – tiny portals which nearly disappear into the tiling of the facade. 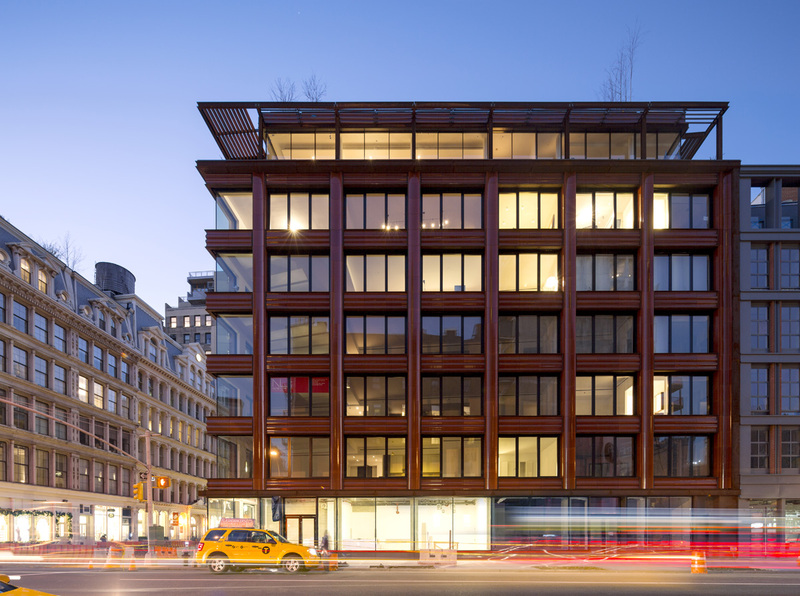 Rodolfo Machado, Principal at Machado Silvetti, says this compositional decision was deliberate: "Perhaps the most effective windows are in the third floor conference room. Here, small windows carefully framing the landscape are quite effective – almost like looking at a painting. In this case, fewer smaller windows work better." Through this modern addition to the Ringling Museum campus, the architects were able to solve programmatic day to day operational issues at The Ringling, which was a big win says Craig Mutter, Principal at Machado Silvetti: “We are particularly proud of this project because our mission was to create a striking addition to this area of the museum that would be a beacon to the visitors on the campus. But we were also able to solve day to day problems the museum was facing, from way finding to operations, to conservation lab connections. We feel this project will have a very big long term impact for the Museum." 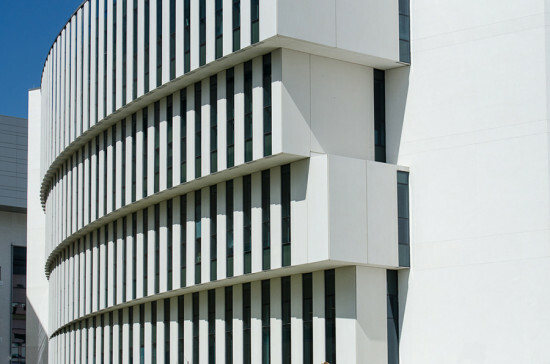 Thanks in large part to advances in protective coatings and insulation products, buildings big and small can be clad in a variety of materials; when creatively sheathed, even a basic box can achieve an anything-but-ordinary appearance. Thermocromex (at top) Thermocromex This limestone plaster ultra-high-performance cladding is a technically innovative reformulation that can be applied to virtually any substrate, including CMU, frame/sheathing, tilt wall, poured-in-place concrete, and lightweight blocks/cement. Available in custom colors, Thermocromex delivers a vibrant and permanent finish that requires no other coloring or topcoat. The alkali- and UV-resistant pigments will not fade over time, and the finish is both weatherproof and breathable. Almost no maintenance is required to enjoy the original appearance, year after year. Features a 20-year material performance warranty. Koda XT 3form A product line developed specifically for exterior projects, Koda XT offers color, durability, and design freedom for the most extreme environments and applications. These panels exhibit the highest performance of any engineered resin panels. The material has the added benefits of being constructed from polycarbonate, which is both environmentally responsible and high-performing. ProdEX Prodema With an outer film of PVDF, ProdEX wood panels have no need for regular maintenance. The PVDF film is also anti-graffiti and non-stick, preventing organic matter from accumulating on the panel's surface and reducing the build-up of dust and dirt caused by pollution. ProdEX is a suitable cladding material for ventilated façades, offering protection from rain, sunlight, and external temperature changes. Insulated Metal Panels Metl-Span These state-of-the-art insulated metal panels perform reliably, are aesthetically pleasing, and come with a proven sustainability track record. Cost-effective and energy-efficient, they are easy to install, ensuring a schedule-satisfying build-speed. TerraPreCast Boston Valley Terra Cotta For decades, architectural designs have involved embedding a facing material in precast concrete panels. TerraPreCast is now available as a finishing material for precast concrete. A minimum 30mm solid terra cotta veneer as well as units with custom profiles can be embedded in large precast units. The dovetail profile on the backside of the veneer provides additional surface area for the concrete to adhere to the terra cotta, ensuring a high-strength bond between the two products. This system is ideal for conditions requiring the strength and durability of precast concrete construction, but desiring the myriad of options available in both profile and finish offered by terra cotta. TerraPreCast panels are available in 2-inch height increments from 6 inches to 24 inches. The maximum length for the panel is 60 inches. Custom product available. Metalwërks Arcwall DBV Rainscreen Metalwërks This drained, back-ventilated (DBV) design provides an interesting exterior appearance while protecting the building’s primary air/water seals from the elements. The wall system incorporates exterior moisture resistant applied insulation, engineered furring, and perimeter flashings all outboard of the primary building air barrier. 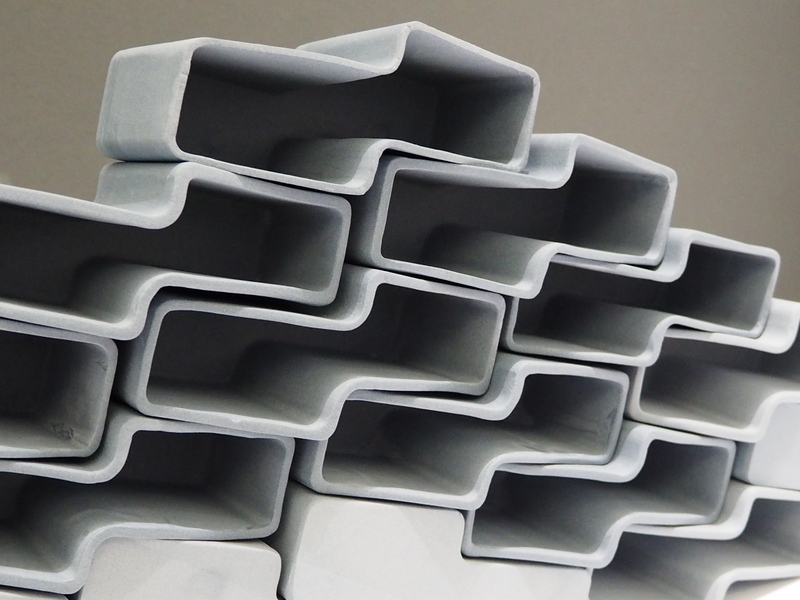 A unique fabrication capability includes a back-scored technique to V-groove the 0.125-inch-thick aluminum plate material down to .040-inch-thick at the fold lines. This method allows the designer to incorporate tighter bend lines, which increases the crispness of the joints and panel edges. The open vertical reveals joint are gasketed to minimize water penetration between the custom panel end-caps and open horizontal joints. The rainscreen system, with its variable patterns, casts numerous shade and light patterns as light changes throughout the day, and the anodized finish creates additional reflections to enhance the effect.